Configuration: 8 boxes per case. 1 pack per box. 9 cards per pack. - Spectra is back with a new parallel structure. New this year, chase the Silver Prizms(2 per case) and White Sparkle Prizms(1 per case). The rest of the parallels are Neon Blue(#’d/99), Red (#’d/75), Neon Green(#’d/49), Neon Pink(#’d/25), Gold(#’d/10), Neon Orange(#’d/5), and Nebula(#’d/1). - Also, new to the base set this year are 20 of the best rookies from this year’s class, featuring Donovan Mitchell, Jayson Tatum, Lonzo Ball, Kyle Kuzma, Markelle Fultz, and Lauri Markkanen. 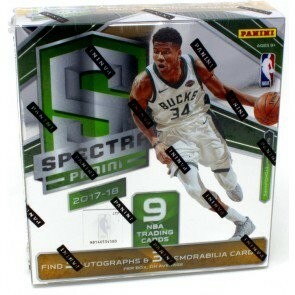 In years past, the rookies have only been available to collectors in the Rookie Jersey Autographs set but this year you will find them in the Base set with Silver(2 per case), White Sparkle(1 per case), and Nebula(#’d/1). Collect the 2017-18 rookie class with this on-card premium opti-chrome jersey autograph set! Every player boasts a base version #’d/299 with parallels down to 1-of-1s. Spectra contains some of the flashiest autographs on the market. In The Zone, Rising Stars, and Illustrious Legends all have a plethora of parallels to chase on premium opti-chrome technology!